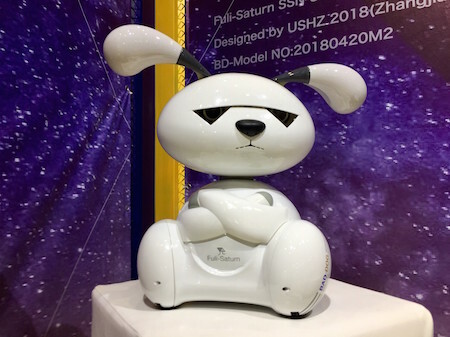 Bad Dog Fuli robot is a first generation prototype intended to give its owner all of the pros (and many of the cons) of dog ownership. It is the creation of industrial design graduate student Zhang Jianning. The first generation of the Bad Dog (事儿狗) Project, Fuli (福狸 ‘auspicious raccoon dog’) has an impressive range of features that mix Tamagotchi digital pets and any future dystopian fantasy of your choice. It can monitor your life signs, receive deliveries while you’re out. Fuli’s eyes are sensors and cameras for helping it navigate and interact. His head and face have sensors which can detect the actions of stroking. He sits upright and moves around on wheels with his arms folded. Unlike real dogs, as far as we know, the Fuli Bad Dog also has an infrared sensor which he can use to measure his owner’s temperature. He will take this into account to decide the owner’s mood and try to react to that. If he believes the owner has been sitting or lying around too much, he’ll also take the temperature to assess whether the human is being lazy, is ill or has simply died. This is really a great idea, and the perfect antidote to all of those saccharin sweet robotic dogs. Obviously, before you can have anything as ill-tempered as a slamhound or a mechanical hound, you'll need to develop a bad dog.